Typically, if you told us a teeny-tiny puppet doll was peddling a tricycle, we'd probably say, "Really, where?!" Consider our curiosities piqued. We wouldn't run away from it, we'd desperately try to find it. 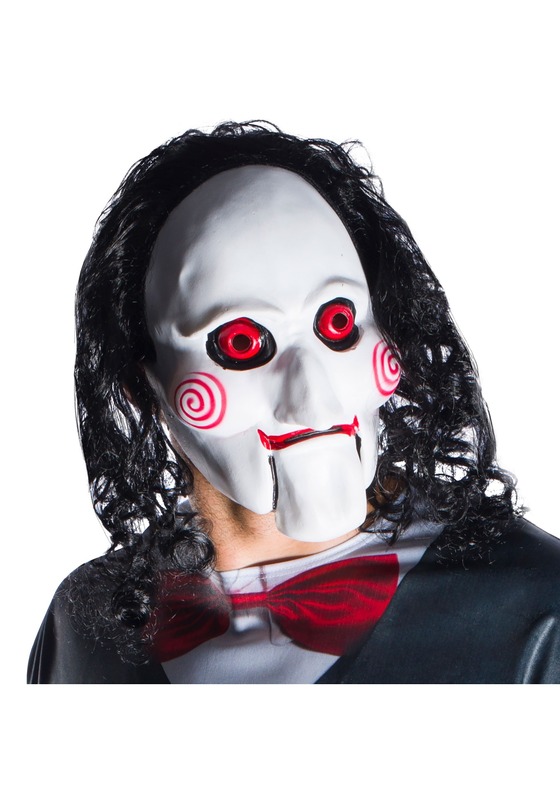 'Hunt him down' would be a better way to put it... until the unfortunate details about the puppet came to light; until we found out the puppet doll is actually Jigsaw's Billy. No balloon animals here folks, just death traps and psychological tricks. Yikes! On second thought, we'd like to take a 10-second head start and run far, far away. The molded mask is painted to look like the horror movie icon with spiral shapes on the apples of each cheek, a crooked nose, and disconnected chin. The curly shoulder-length black hair is attached to the mask's top so wearing a wig isn't necessary. Joke's on you if you decide to wear makeup instead of this realistic mask. Complete the look with a red bow tie.